Chives are one of the most versatile of garden plants, grown for both ornamental and culinary purposes. The purple flowers and a peppery scent of chives make them a favorite in perennial borders, and in the kitchen, they offer a mild onion or garlic flavor that serves well in many recipes. 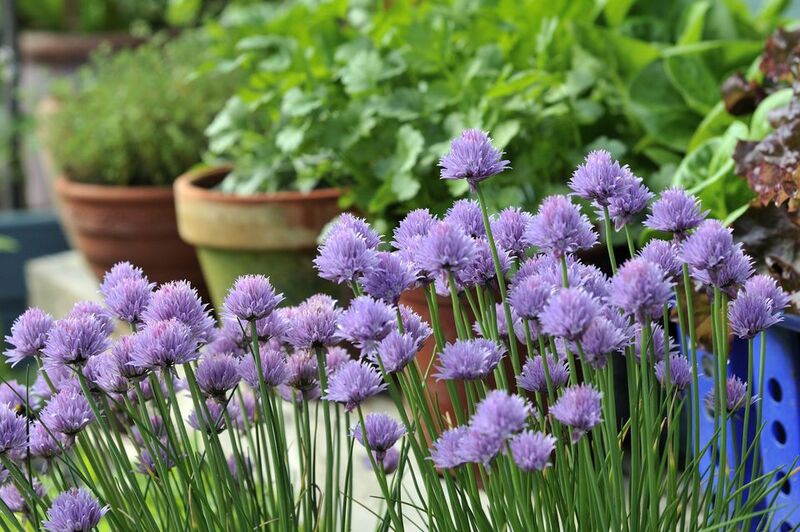 Even non-gardeners often grow a pot or two of chives on the patio or deck, or in a kitchen window to use for cooking. But chives is a vigorously growing plant, and cooks who grow even a small pot of them are often left with an abundance of riches that never seems to run out. Never fear, here are some ways to put every last one of your chives to good use. Chives make vinegar glow with beauty. In a literal sense, the vinegar actually glows with a hot pink shade of lovely color! By adding your chive blossoms to white vinegar, and keeping it out of direct sunlight, you can create deliciously flavored chive blossom vinegar that is perfect for salad dressings. An interesting fact: If you do keep your chive blossom vinegar in the sunlight, it will fade fast. If even if it does become clear, it will still keep the wonderful flavor. Sprinkle fresh chives blossoms on your next fresh salad to give it a light onion flavor. The blossoms are just aromatic enough to enhance the dish, yet not so strong as to leave your guests with that telltale onion breath. You can also chop up chive blossoms and mix them into cream cheese dips—the added color is pretty and interesting, and the additional spark of taste is always a hit. Note that the stem under the flower can be tough. When harvesting the chive blossoms, remove the stems if you can. Trim them off when you harvest the chives. The stems do compost well, however. You may love garlic butter, but you haven't lived until you make a compound butter using chive blossoms. Make it by simply chopping up chive blossoms and adding them to melted butter. Make it at least one hour ahead of time, which will allow time for the flavors to develop. You can then reharden the butter in the refrigerator to use as a spread. Chopped chive blossoms marry well with garlic and other spices, holding up the other flavors without becoming too overpowering. Chive blossom butter makes a wonderful coating for any steamed vegetable. Simply slice off a pat and allow it to melt under the warmth of the fresh sauté. This butter can also finish a cheese sauce with a taste that your guests will enjoy immensely, even if they can't identify it. As described in the book "Lasagna Gardening With Herb" by Patricia Lanza, long chive stems can be used to tie up herb bundles. But the same technique can be used to tie up bundles of vegetables such as asparagus and green beans for cooking. The ties themselves are perfectly edible, especially after they are roasted, grilled, or sauteed with other vegetables. The very best way to make use of chives is, of course, to add them to recipes—and to do it with abandon. Many recipes make prominent use of chives, and you will rarely be disappointed when you experiment by adding chives to your cooking, even if a recipe does not call for them. Chives is within the onion/garlic family of plants, but it has its own level of spicy taste that is milder and more pleasant than the sharpness sometimes found with onions. A family member who is not fond of onions will very often tolerate and even enjoy the taste of chives. If you are growing your own chives, harvest them as often as you can to keep the stems thin and fresh. Snip them off flush to the ground, to avoid the unattractive appearance of brown tops on the new growth as the stems regrow. Although these dark tips do not detract from the flavor, they may darken in cooking and will be unappealing in dishes. Chives freeze very well without turning brown. If you find that you still have leftover chives after all efforts to use them up, simply harvest bundles of chives and place them in a neat stack in a ziplock bag. Whenever you need them, the frozen chives can be snipped and added to any recipe you want. Delicious!